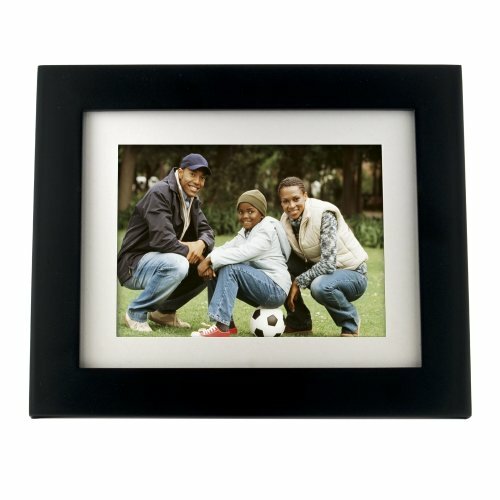 The Panimage PI8004W01B 8 inch LED Digital Photo Frame is plug and play for fast, easy transfer and display of your digital photos. No software is needed, just use a USB cable (not included) to connect the frame to your pc and start dropping and dragging directly to the frame's internal memory. Alternatively, you can transfer photos and video from your memory card or digital camera. Store up to 2000 compressed images on the 256MB of internal memory. The built in 5 in 1 card reader recognizes xD/MMC/SD/MSPro/MS formats. To begin a slideshow, simply insert your memory card, and enjoy. The viewing aspect ratio is a generous 4:3, and the 800x600 resolution LCD panel within a black wooden frame blends with any decor.